If you frequent my blog with any regularity, I hope you know I'd much rather praise a movie than damn it. Frankly, it's a matter of my own continued mental health: I don't relish devoting my time or energy to movies or TV programs I don't enjoy. Not when there is so much out there that I do very much enjoy. In some cases, obviously, it's just not possible to avoid a negative review. 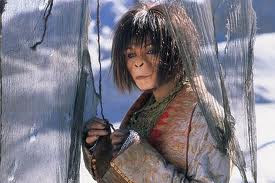 Tim Burton's re-imagination of Planet of the Apes is surely one of 'em. I first saw the film in theaters in the summer of 2001 and disliked it immensely. Then, in preparation for this review, I watched it again for the first time in a decade, hoping that it had aged in some fashion that would make the film seem more interesting or at least palatable. Sadly, that isn't the case, either. Before I delve into the specifics of the re-imagination, I'd also like to establish for the record that I'm a big Tim Burton fan, and that I admire many of his films, but especially Edward Scissorhands (1990), Ed Wood (1994), Sleepy Hollow (1999) and Big Fish (2003). The following review isn't about any dislike for the artist or his oeuvre, only my dislike for this particular 2001 film. But his version of Planet of the Apes? It's a missed opportunity on a colossal scale, and -- for long stretches -- a surprisingly dull and joyless film. Many of the movie's egregious flaws can be traced back to the script, which focuses on off-the-shelf, uninteresting characters who prove almost impossible to care about. Additionally, Mark Wahlberg is badly miscast in the lead role, and can hardly feign interest in even the best aspects of the material. Worse than those problems, this re-imagination of Planet of the Apes feels largely studio-bound and claustrophobic rather than epic, and the film offers only very little in terms of the franchise's trademark social commentary. In fact, a central moment late in the film actually undercuts the original franchise's strong anti-war message. In short, Planet of the Apes -- the re-imagination -- is an empty, mechanical exercise in blockbuster movie making, and one without a beating heart to call its own. In 2026, the USAF Space Research Station Oberon encounters a strange electromagnetic storm nearby in space. A test-pilot -- a chimp named Pericles -- launches a pod to investigate, but becomes lost in the space vortex. Pericles' human trainer, astronaut Leo Davidson (Wahlberg) attempts to rescue Pericles, but is drawn into the phenomenon himself. His tiny ship crash lands on a nearby planet in the year 5021 AD, and Leo finds himself on a world in which intelligent apes rule, and humans are slaves and second class citizens. After his capture by the simian slave trader Limbo (Paul Giamatti), Leo finds himself a servant in the home of Senator Sandar (David Warner) and his "human rights faction" daughter, Ari (Helena Bonham Carter). With a group of slaves in tow, including the beautiful Daena (Estella Warren), Leo attempts to escape the city. While Leo, Ari, Deana and others make for "the Forbidden Area" called Calima where ancient ruins from ape pre-history are located, the human-hating General Thade (Tim Roth) and General Attar (Michael Clarke Duncan) attempt to hunt down the fugitives. Thade's dying father also warns the General that humans once possessed fearsome technology. In the Forbidden Area, Leo discovers the ruins of his home base, the Oberon, and learns that the station crashed on the planet thousands of years earlier, while attempting to rescue him from the temporal vortex. The test pilot apes aboard the station then rebelled against their human masters, and a new order -- a planet of the apes -- was born. 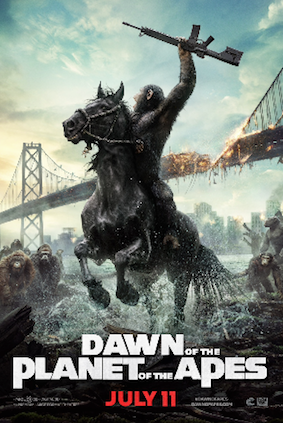 There are many Planet of the Apes fans, I realize who disliked this re-imagination almost a priori because it totally discarded the familiar franchise mythology and went in a totally new direction. I actually don't hate the film on that basis. The screenwriters, Lawrence Konner, Mark Rosenthal, and William Broyles Jr. clearly studied the existing franchise and decided to go in a new direction that would -- despite the fresh take -- re-shuffle the familiar ingredients already popular in the five-strong saga, 1968 - 1973. To wit, this re-imagination involves time travel, a human-friendly chimpanzee female, a spaceship crash in a lake, a hunt of humans by apes, desert scarecrows (! ), an artifact from an earlier, technological era (a gun here, instead of the original's baby doll), and the secret of ape history...buried in the Forbidden Zone/Area. 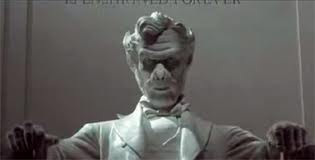 The new film also boasts a surprise ending in the spirit and mode of the Statue of Liberty climax, and re-purposes much of the original film's most memorable dialogue, including "Damn them all to Hell" and "take your stinking paws off me..."
By purposefully re-using all of these familiar ingredients (down to a cameo by original star Charlton Heston), this 2001 version of the Planet of the Apes attempts to re-capture the vibe and aura of the original franchise, if not the narrative details. It's not a terrible gambit as far as "re-imaginations" go. After all, would we want to see a shot-for-shot remake, or the same exact tale depicted again? Either of those options would have invited only invidious comparisons to the 1968 film. 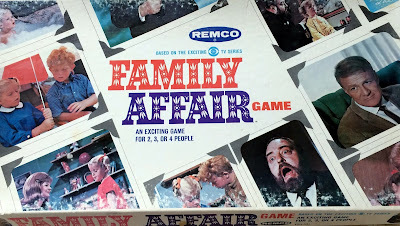 Part of the game in remakes is finding a fresh angle, and altering some of the narrative details so as to keep knowledgeable audiences off-base. So I give the film it's premise, and it's invention of a new planet of the apes. I would have preferred a straight-up sequel to the original franchise, or even a faithful adaptation of the Pierre Boulle novel, but okay. And yet the re-imagination fails so dramatically because the people and apes who populate this new story are not interesting, unique, or well-written....even in the slightest degree. In fact, everyone is a two-dimensional cartoon character, and that fact severely limits the narrative's capability to surprise, amuse or otherwise involve the audience. If you don't care about the people involved in an adventure, the clever details of the adventure are almost unimportant. The biggest problem is Leo Davidson. He's a test pilot who flies into a time vortex in pursuit of a rogue chimp and crashes on the planet of the apes. He then spends the entire movie trying to get back home. Because Leo's only purpose is escape and a return to space, he never truly engages or confronts the ape culture, at least not in the thorough, dramatic fashion that Taylor had to countenance it. In the original film, there was no escape for Taylor...and he knew it. His ship was destroyed and he was 2,000 years beyond his own time period. Where was he going to run? Taylor had to stand trial before the apes and battle wits with the cunning Dr. Zaius. The planet of the apes was his (very big) problem, and there was no avoiding it. He had to be emotionally and personally involved in what happened to Zira, Cornelius and Nova because he was going to spend the rest of his life on this planet. In the new Planet of the Apes, Leo breaks out of Ape City and just runs and runs until he can run no further. He hardly countenances the apes at all. They're just a temporary and bizarre inconvenience until he can track down a ship using his homing beacon. His involvement with the politics and problems of the apes then, is nil. And since he doesn't seem to care about the apes or the humans of this world, the audience doesn't care either. Worse, Leo doesn't seem to have much happening in terms of his personality. As was immediately clear from the original Planet of the Apes, Taylor was a cynic, a misanthrope, and an acid wit. He had a perspective on life that was evident in every action he took. Leo is essentially a run-of-the-mill jock, a pilot who has haphazardly wandered into the planet of the apes and wants to get off, to quote The Simpsons. There's absolutely nothing else to him. What's his philosophy about mankind? About space travel? Why is he in the space service in the first place? Any touch of color or differentiation would have appreciated. Early on, there's the tiniest bit of attention given to the fact that apes get to fly spaceships instead of humans, and that this strategy irks Leo. He wants to be an explorer and a leader of men, we intuit, and yet when he is thrust into this active role of leadership on the planet of the apes, he completely rjects it. He denies and shirks his duty until the very last minute. There's simply nothing unusual, interesting or noteworthy about this character, and since Leo is our surrogate in the picture, almost every aspect of the movie falls flat. At one point in the film, Ari notes that Leo is different from the other humans she has met; that he is unusual. How so? He hasn't spoken to her with greater sensitivity, revealed to her particularly much by way of superior intelligence, or even demonstrated remarkable physical agility. We're just informed that he's special, and yet it just doesn't ring true with what the audience sees. Why is he special or unusual? The movie can't be bothered to show the audience. We just have to accept that he is unusual because Ari says that he is, and because he's obviously the movie's "hero." It's lazy. I like Mark Wahlberg. But he's out of his depth, or comfort zone, or something, in Planet of the Apes, and just doesn't carry the film in the way that he should. And he doesn't get any help from the flat writing, either. Wahlberg's "inspirational" speech to the humans before battle in the Forbidden Area is a career low-point for the performer. It's half-heartedly delivered...on top of being poorly written. Unfortunately, the other characters in Burton's Planet of the Apes are no better drawn than Leo. The villain of the piece, General Thade (Tim Roth) is another two-dimensional cartoon character, an ape who just really, really, really hates humans. There is no motivation for his overwhelming, epic hatred for humans voiced in the film (except the flimsiest of excuses about them infesting the provinces outside the city...), so he's just a cog in the screenplay's wheel. The film needs a human-hating bad guy, and Thade provides that. But no more. Roth is another great actor ill-served by the script. Thade sneers and hisses and jumps and growls, but doesn't register beyond those over-the-top histrionics. Ari is likely as bad, in the other direction. She is the "liberal" daughter of an ape senator and part of the "human rights faction" but we never know or understand what drives her activism. As much as Thade is bad because the movie requires a villain, Ari is "good" because the movie requires a friend to help Leo. In the original film, of course, Zira got to know Taylor and came to understand and like him. At first she was fascinated and a little afraid of him. By the end of the film, they were friends. Ari is automatically on Leo's side from her first meeting with him, and risks everything in her life to help him escape. Again, it doesn't quite ring true. How did the indulged, affluent daughter of a politician come to be such a fearless human rights advocate? The movie owes the audience some kind of explanation. Then there's Warren's Daena, a very, very pale echo of the Nova character in the original. Only here, Daena clearly wears glossy lipstick in all her close-ups (where'd she get it?) and is good for nothing plotwise except casting jealous looks at Ari and Leo as they grow closer. Daena inspires none of the action in the film, and isn't even a romantic interest in the narrowest definition of that word. She's just eye candy. And at the end of the film, Leo leave the planet without hardly a glance back in her direction. She is probably the most useless and ill-used character in the film, and that's saying something. 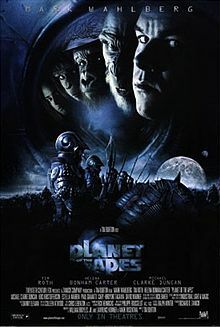 Even ostensibly weakest of the original Planet of the Apes films, Battle for the Planet of the Apes, thought to add layers of individuality to the film's characters. Caesar was gripped in an existentialist crisis about his decisions, and how to bring about the future he desires. Mandemus was the custodian of Caesar's conscience, but one who was tired of being locked in the armory and yearned to be free of the grave responsibility. Aldo and Kolp -- the film's villains -- were depicted in either recognizable human terms, or at least quirky ones. They had some semblance of personality or distinction. The characters in the new Planet of the Apes are all drones who plug story holes, but aren't recognizable as individual personalities. We've got a hero, a villain, a love interest and the by-the-numbers comic-relief, Limbo. Another big disappointment with the film is the betrayal of the Planet of the Apes' franchise's anti-war (and especially anti-nuclear war) legacy. Late in the film, Leo discovers that the Oberon's nuclear fuel is still operational and conveniently powering the ruined ship. He rigs it to deliver a death blow to the advancing ape army. Where the other ape films expressed anxiety about the use of nuclear weaponry, here a weapon of mass destruction is merely a convenient tool to even the odds in combat. We are encouraged to cheer when Leo pulps the attacking apes by the hundreds, and again, this simply isn't true to franchise history. This ape story is thus merely an adventure about a freak twist of time, and not a comment on man's self-destructive nature. It's okay for Leo to kill the apes; there's no commentary or rejection of his actions. Again, he's the "good guy" a priori, right? In terms of social commentary, there's not much significant here at all. One character, Limbo, gets to give voice to Rodney King's plea for civility, "can't we all get along?" There's also a line about a "human welfare state," but these are the limits of the film's social conscience. This dearth of commentary or subtext is a double disappointment, because Tim Burton's films often feature commentary on what it means to feel disenfranchised; to be an outsider to the establishment. Planet of the Apes could have been re-formed and re-purposed to adhere to this career-long obsession with a better, more knowing script. Instead, Burton's familiar theme is just barely touched upon in Ari's predicament, since she's accepted by neither apes nor humans. The re-imagination of Planet of the Apes also suffers from its look. Matte paintings have replaced the life-size structures of the original Ape City, and studio locations have largely replaced exteriors. Alas, these are two of the enduring delights of the original Planet of the Apes. There, you had the sense of a full-blown world, from the arid Forbidden Zone to the green belt surrounding the city, to the simian metropolis itself. It was a fully-realized world and not a closed-off movie world in so many ways. This re-imagination forsakes those strengths. It also forsakes any attempt at suspense or build-up of anticipation regarding the appearance of the apes themselves. Where the original film took forty minutes to get Taylor captured and to Ape City, Burton's Planet of the Apes gets Leo and the apes together within just fifteen. It feels rushed. The make-up work of Rick Baker is impressive, to be certain, but after a week of watching ape films, it doesn't seem to me that the work here is a quantum leap ahead of the sixties film. Especially when the make-up is essentially the only truly interesting element of the film. The new concept of the apes -- which puts them on all fours when they run, and allows them to jump and swing from trees -- is certainly a new wrinkle, but somehow it registers as being less civilized, which runs counter to the point of the whole enterprise. I also must confess, I missed the idea of an ape social hierarchy or caste system here. There's almost no thought given to the details of the ape culture in this film. Planet of the Apes' surprise ending has been the source of much debate over the years. In the climax, as you will recall, Leo returns to Earth and discovers that General Thade has been there and managed a coup. Earth too, has become a planet of the apes, as the Lincoln -- now Thade -- Monument memorably attests. Since the movie concerns a time paradox in space, I don't find it impossible that Thade could have somehow, in some reality, accomplished this revolution on Earth. Instead, what bothers me concerning the finale is that the ending carries almost no emotional weight. It feels like a trick or gimmick, not an outgrowth of the film's story. Like so much of the film, there's just no emotional connection to it. What does Leo learn about himself, human nature, or life in terms of this ending? Nothing, really. Unlike the joyless, interminable battle in the desert, at least the ending of the film in Washington D.C. boasts the distinction of being beautifully shot. It just comes out of left field. 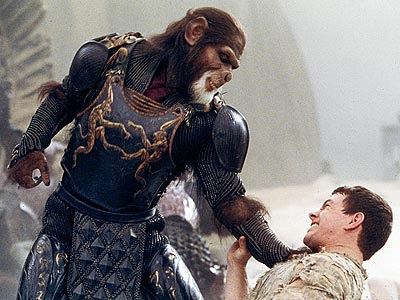 The 2001 re-imagination of Planet of the Apes lacks subtext, characters to care about, a connection to the franchise's past, and a driving narrative beat. It almost seems to curl up and die on the screen while you're watching it, a veritable cinematic disaster. When General Thade grabs Leo Davidson and looks down inside his throat, asking "is there a soul in there?" audiences may want to direct the very same interrogative to this flat, lifeless "brand name" movie itself. Is there a soul in there? Anywhere?